FORT WAYNE, Ind. 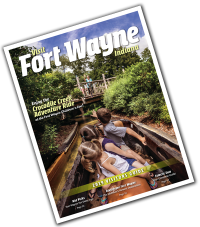 - During MLK Weekend, Fort Wayne will host three sports tournaments and a music conference that will attract over 18,000 visitors to our city, according to Visit Fort Wayne&apos;s estimates. In sports, the Fort Wayne MLK Volleyball Challenge and 10,000 visitors will return to the Allen County War Memorial Coliseum from January 14-15. Gym Rats Basketball will host its annual MLK Classic from January 14-15 at the SportONE Parkview Fieldhouse, and the National Softball Association will hold the Snowflake Frenzy at Plex South from January 13-15. In downtown Fort Wayne, the Indiana Music Education Association will convene for its annual Professional Development Conference at the Grand Wayne Convention Center. From January 12-14, the conference welcomes more than 2,500 music professors, teachers, and students for workshops, performances, and a trade show. For more information on MLK Weekend in Fort Wayne, contact Visit Fort Wayne President/CEO Dan O&apos;Connell at (260) 427-3700.